Briefed to create a bush garden, rwa’s design response for this garden in Mt Eliza is a successful integration of the dwelling into a natural coastal environment and provides cohesion between disparate spaces of the landscape on a 2500- square-meter site. The architecture of the house, by Bird de le Coeur architects (Architecture Award in the residential category in the RAIA Victorian Awards) is a three winged take on multi generational living with the wings at once individual and overlapping. Throughout the design process, the integration of the landscape into this cluster of forms was of paramount concern. Working closely with the architects, rwa were able to provide a series of landscape experiences that engage with the plurality of the dwelling. A partially enclosed central courtyard which is visible from all rooms of the house was envisaged as a arid garden with echoes of the surrounding coastal landscape. 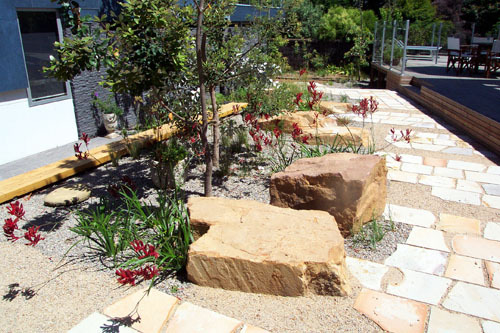 To achieve this effect, local Dromana crushed granite was used as mulch with Mt Angus sandstone paving sawn on two edges to create a paving style that was consistent with the emergent, informal nature of the design. Large sandstone rocks were used as features. The central locality of the courtyard, and its different levels in relation to access points from the house posed a challenge that required lateral thinking to resolve in visually interesting ways that contributed to the overall experience of the landscape. For example the lower level on one side has a retaining structure which has been clad with timber to also function as seating. Adjacent to the central courtyard the timber skin of the architecture wraps onto the ground surface, becoming a deck that hovers above ground level and connects to the primary external object; a lap pool. Built above ground and taking advantage of the topography of the site, the pool is clad in black tiles that are continually draped with water from the overflowing edge. It becomes a dark, wet object and a perfect counterpoint to the bright dry courtyard. Asides from creating a dramatic visual presence, the spillover of the pool also serves a functional purpose of preventing the water surface from being whipped into waves on a site that is frequently buffeted by strong winds off the sea. 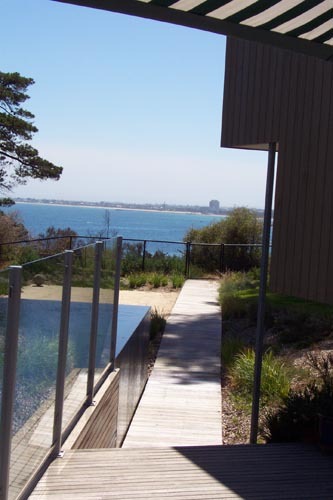 To maintain the views to and from the pool, a sand garden with bordering low growing, local coastal plants spilling into the space was used to create a beach effect consistent with the scheme. In front of the sand garden is a low lying area that tends to accumulate water, rather than fight with the conditions, rwa’s response was to work with it and designed the area as a bog garden. Another design challenge was the number of 100 year old cypress trees sited virtually on the edge of the cliff overlooking the sea. These trees were retained to frame the view over the bay. However, one of the main bed rooms looks out on to the front and a certain degree of screening was required for privacy. 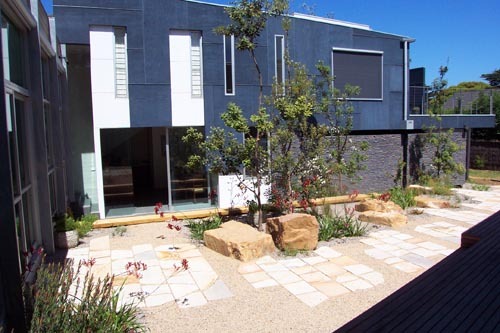 This challenge of avoiding critical root zones and providing screening without obstructing any views was resolved by creating thin, windsock shaped garden beds that bleed from the lawn area onto the gravel path at the front of the house. The shape and positioning of the garden beds as well as the planting selection including local she-oak Allocasuarina littoralis, allowed views through to the bay while also providing the necessary screening. An important aspect of this landscape is that no irrigation has been installed. All plants were selected for drought tolerance.